During Carnival Corp’s conference call for financial analysts to discuss their third quarter results earlier this week, a recurring topic of conversation was the Carnival Cruise Line brand. It’s no secret that this is a trouble spot for the company since the brand had a couple of high-profile incidents with their ships earlier this year that kept them in a very negative light at the top of the consumer news for a lengthy period. The company had bad news and some good news to report about the Carnival brand. But it was something I noticed in the way they were reporting it early in the call that surprised me. The Port of Barcelona announced an agreement today with Carnival Corp to build a new 107,000 square foot cruise terminal at the port. Divers today believe they found the remains of the final two people missing from Costa Concordia. Those protests over the weekend in Venice that delayed cruise ships by a couple of hours may have done some good for the protesters’ cause. Yesterday, MSC executive chairman Pierfrancesco Vago said the industry has agreed to discuss alternatives to the route which sails down the Guidecca canal past St. Mark’s Square. That could mean moving the port or the cruise terminal to accommodate some other route. * What? No Grey Poupon? Crossing the Atlantic today, on one of her regular runs, Queen Mary 2 made a special delivery in the middle of the ocean. QM2 left New York on Sunday, but yesterday its crew received a special request for assistance from Mylene Paquette, a Canadian rower is attempting to become the first North American woman to row solo across the Atlantic. 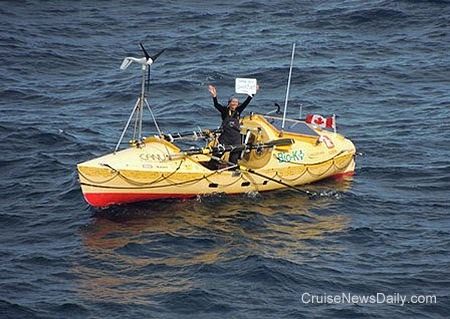 She started out from Halifax on July 6 and hit the remnants of Atlantic storm Humberto and lost her anchor, satellite phone and other supplies. Rower Mylene Paquette as seen from Queen Mary 2 today. When someone takes a Crystal Cruise, it means they want something special. Often that trip includes a special occasion or a celebration, and for those people, Crystal can now create something extra-special and unique. Crystal has partnered with Imagine VIP to fashion Crystal Celebrations who can design something as unique as their customers desire. CND subscribers also read about a crew member going overboard ... the first was so good, they'll have another ... and another cruise line finds Banana Coast "appealing." Last spring when Royal Princess’ propeller blades were damaged in the yard, replacements were borrowed from a P&O newbuild that could only be referred to as the P&O ship because it didn’t have a name. 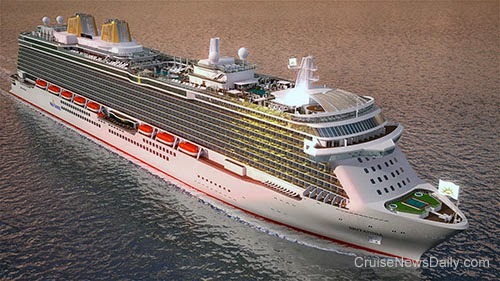 After a high-profile announcement in London today, the 141,000-ton sister to Royal Princess now has a name - Britannia. There is good news for the passengers who are scheduled to board Royal Princess on Friday for a 12-night cruise to Venice. Princess says they will have completed repairs on the ship’s electrical system, and passengers should proceed to Venice, because the cruise will operate as scheduled. CND subscribers also read about protesters delaying ships at Venice ... and it being nice of her to drop in. A power outage on Sunday aboard Royal Princess, which was just delivered in June, has ended up causing Princess to terminate the voyage early and begin working to get the ship fully repaired before the next voyage, which starts on Friday. The outage occurred while the ship was sailing between Mykonos and Naples as part of a 12-night Mediterranean cruise from Venice to Barcelona which departed on September 15. STX France took the first concrete step in the actual building of the Oasis-class ship for Royal Caribbean when they cut the first steel for the ship today. The event took place at the Saint-Nazaire (France) yard where the ship will be built. MIAMI, Sept. 18, 2013 – Royal Caribbean International, the cruise brand known for the best entertainment at sea, today announced the appointment of Nick Weir to Vice President of Entertainment. Nick will oversee the cruise line’s onboard entertainment and guest activities programming, as well as Royal Caribbean Productions, the industry’s only in-house department that creates, produces and manages the largest entertainment operation at sea. Nick joins Royal Caribbean with more than 25 years of experience in both the entertainment and cruise industries – with notable achievements in performance and production, both on- and off-stage, in almost every aspect of the entertainment world. He comes from a tradition of maritime entertainment, where his mother was an accomplished cruise entertainer and his father was a pioneering Cruise Director. Nick also hosted and presented a number of major network television shows in the United Kingdom before moving to the United States. He is best known for hosting a re-launch of the primetime network-television show "Catchphrase," where he succeeded in the mission of markedly improving the ratings in the critical 18-54 target demographic. For the past 10 years, Nick owned and operated an entertainment consulting company with projects that included television and live event production services, speech and script writing, entertainment program analysis and solution development, charity event/live auction production, corporate video production, cruise industry start-up projects and Cruise Director services. Additionally, he has served in many capacities in the cruise industry, including as Entertainment Consultant and Cruise Director for Celebrity Cruises and Costa Cruises, and consulted extensively for Star Clippers Tall Ship Cruises. Nick studied Marine Science and Biology at the University of Miami and holds a Business Administration degree from Columbus International College in Marbella, Spain.